When it comes to choosing a suitable mattress for heavier people, we have to consider a few different factors than with thin people. We all want to have a good night and to wake up rested and refreshed. But if our bed sags and sinks after a few months, it's not going to work, right? It's relative what's considered overweight or heavy these days. Some people can be regarded as heavy at 150 pounds while some are not even at 200. Even though these mattresses can support up to 300 lbs, we are going to say that 200+ pounds are considered heavy / larger or overweight. To help provide the best possible sleep experience for heavier or larger than average people, we have selected our top picks this year. Are There Good Budget Brands? WinkBeds claims to have designed the first mattress for sleepers over 300 pounds with their Plus option. The Plus is a hybrid model, with foam and latex over coils that provide comfort and support. It has a medium-firm feel that should be supportive in all the right places. Its Tencel cover is soft and helps wick away moisture at night. It also features enhanced edge support around the perimeter made from dense foam that increases the usable surface space of the bed. What makes it special? Winkbeds Plus was designed for individuals over 300 pounds, and it's a heavy duty bed. It is a durable luxury model with enhancements, such as zoning in the coil layer with tempered springs, that work very well at providing support and comfort to its target market. The Plus also works with the brand’s coolControl™ base that provides the ability to set a temperature that the base and bed will maintain throughout the night. This bed is compressed for free shipping, or you can select optional White Glove Delivery at an additional cost. Want to learn more about this model? Check our in-depth review of the Plus. At 15 inches tall, DreamCloud is a very thick mattress, which is great for accommodating a higher weight range. Its hybrid design blends a variety of materials for a remarkably comfortable experience, such as memory, poly, and latex foams, as well as innersprings. Sleepers should feel more on than in this mattress, and it is relatively quick-responding. A plush Euro-style pillow top, cashmere cover, tufting, and handles on the side are some of the premium features available on this bed. It even has extra foam around the edges for better edge support. What stands out? 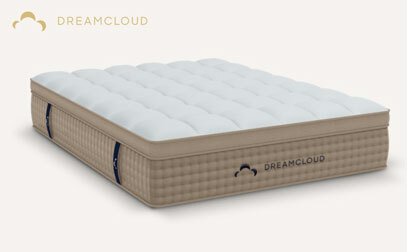 DreamCloud is an exceptional value hybrid that incorporates eight layers, a 365-night trial, and an Everlong Warranty. The brand states that their product is priced at 30% of in-store models. In addition, DreamCloud has a special five-zoned coil layer for optimal support. The coils are individually wrapped and do a good job of minimizing motion transfer on this bed, in combination with the top comfort layers. If you want to see more, visit our in-depth analysis with pros and cons. 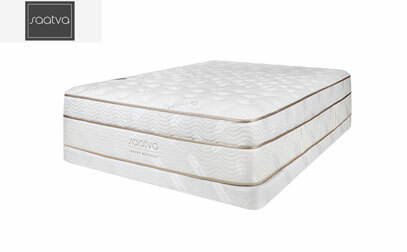 Made in three firmnesses, including Plush Soft, Luxury Firm, and Firm, Saatva is an excellent choice for heavier people who like a more traditional innerspring feel. It has airflow through two layers of springs, and the bed has a good bounce. Saatva has included several premium-level features in their bed, such as a special lumbar support enhancement layer, coil on coil construction, and a reinforced foam perimeter for even greater edge support. It even has a durable Euro pillow top and organic cotton cover. What makes it unique? Saatva is an affordable luxury innerspring brand. Its construction and stitching are high-quality and it is far less expensive than comparable in-store models. The purchase of each Saatva comes with free White Glove Delivery and the removal of your old mattress. There are two thickness options for your order, a 14.5-inch Premiere Luxury, and an 11.5-inch Custom Slim. Especially with the thicker model, there is a decreased risk of bottoming out. 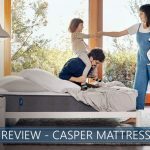 If you're not sure, and you want to see more before you purchase the bed, check out our full Saatva review. Layla has two sides – Medium-Soft and Firm – to help you find your most seamless fit. The Medium-Soft side excels in pressure relief and the brand’s 120-night trial provides time to adjust to the side that works best for you. Not only does it supply superior pressure relief, it also has a cover made with ThermoGel® that is cool to the touch. Unlike traditional foams that can feel suffocating or overheat, Layla yields deep contour and comfort without the high risk of increased temperature levels. What are its best features? Layla is a memory foam option that works well at relieving the pressure points of heavier individuals with decreased risk of bottoming out. It has copper infused in its memory layers that conducts heat away from the sleeper and enhances deep compression support. Layla’s overall cooling and pressure relieving capabilities make it a very good value. Need to learn more? Check out our Layla analysis here. Avocado creates a luxurious eco-friendly experience for sleepers that is backed by many certifications geared towards low emissions, natural materials, and lack of harmful chemicals. 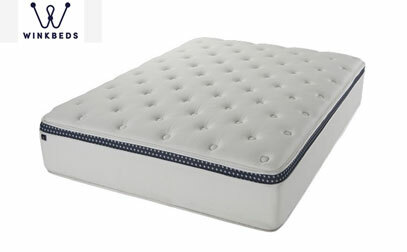 The brand features an optional pillow top for additional comfort, which contains two inches of Dunlop latex. Back or stomach sleepers who prefer a firmer feel may benefit from their standard version without the pillow top the most, while side sleepers can enjoy thicker pressure relief with it. What makes it special? 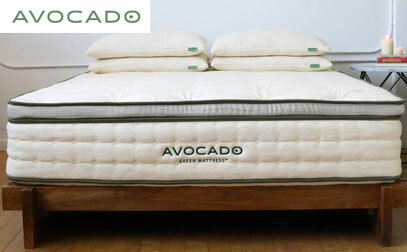 Avocado’s commitment to being green is seen directly through their mattress’ construction. An organic cotton cover, New Zealand wool, and natural latex work together with upcycled steel springs to provide a durable, comfortable bed night after night. In addition, it has a zoned construction in the coil layer for even more support and relief where it is needed most. The edge shares the same coils as the middle third of the bed, where springs with lower diameters and more support capabilities are utilized. 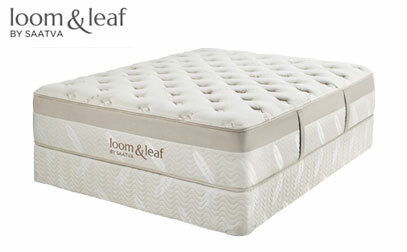 Loom & Leaf is a premium brand that ships in two firmnesses, Relaxed Firm and Firm, and the latter is our preference for a firm memory foam feel. This option will be especially good for stomach and back sleepers, who may prefer the additional support it brings. What stands out? A layer of Spinal Zone Gel can be found in the lumbar area of the mattress. It creates additional support for the spine and the gel adds cooling for those who are prone to overheating. Loom & Leaf uses eco-friendly materials, such as its organic cotton cover and flame retardant made out of natural woven thistle, in addition to certified foams that meet low emission and rigorous chemical standards. The design of its egg crate shaped memory layer increases airflow and includes gel swirled in for extra cooling. Loom & Leaf is not compressed like some online brands. Instead, the company supplies free White Glove Delivery and mattress removal. The bed even comes with sturdy handles on the side to help with repositioning as needed. Is it good for you? Read our complete assessment to see the pros and the cons. Zenhaven is our latex pick. It uses American-made Talalay latex, which has two more steps in its creation than Dunlop latex, including creating a vacuum and flash freezing, which makes it an extremely consistent material. 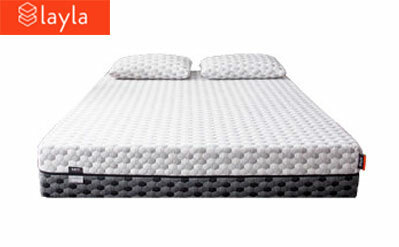 This specific Talalay material has larger cells and greater airflow, which helps with cooling. Talalay resists microbes, mold, and dust mites, and the brand uses organic materials such as New Zealand wool and a cotton covering. Luxury Plush and Gentle Firm options are on either side of the bed, so you can purchase one mattress that has two firmnesses to test out. What makes it unique? Zenhaven’s Talalay latex has five zones that are tailored to every part of the body to help with alignment of the spine and additional comfort. This is through the creation and spacing of pinholes with varying densities. The company provides free White Glove Delivery to your home and their professional service will even take your existing mattress away for free. Want to know more about this latex bed? See our pros and cons in our complete overview of the Zenhaven. Created by Dreamfoam, Ultimate Dreams Latex is our budget choice. Even at a lower price point, it does a good job of catering to heavier weights. The latex in the bed is hypoallergenic, making it a particularly good option for those who have allergies. It has a cover with bamboo fibers (that are completely biodegradable) that is quilted with soft reflex foam. The reflex foam and latex layers sit on top of a dense foam base. The bed is soft to the touch and has wicking abilities that help reduce excess moisture. What stands out? Even though Dreamfoam uses a more expensive Talalay process on their latex, the company has managed to keep their bed extremely affordable. The price and quality make it a great budget choice. After purchasing, the company will make contact to determine the firmness level that you need for optimal comfort. Then, you will have a generous 120 nights to try it out. Although there are general standards that can help anyone choose a new bed, people with over 200+ pounds have special needs that should not be ignored. This is critical in most cases. Using lower quality materials will most likely result in sagging and worse sleep experience after some time. Even though most beds last for well over six years nowadays, if you opt for cheap products with low-quality materials you will most likely have to change it after 2-3 years. And that’s not something many of us want to do often. If you are less than 200 lbs, a 10” bed is more than enough in most cases. If you are heavier than this, you will want to consider 12” or thicker with good deep compression support. Keep in mind that some products offer extra thick layers that provide enough support even at 10-11”. You can decide your ideal firmness level by first determining your ideal sleeping position. Heavier people typically require medium to medium-firm. A higher weight tends to create more sinkage and hug, and you could experience back pain if not properly supported. Expect an additional 1-2” of sinkage if you are over 230-250 lbs. You can help to compensate for that on a firmness scale by choosing around 7-8 out of 10. However, depending on the brand and its construction, there can be some exceptions. What mattress you pick out depends on more than just your body size and shape. You will also need to consider what sleep positions you tend to gravitate towards because your weight is distributed in different ways and will require different support and comfort considerations. For side sleepers, pressure relief is key because in this position your full body weight is pressing into the mattress along a narrower surface area. For many sleepers in this position, a plusher bed is a better match because the softness allows all their weight to sink in and conform to their curves to minimize pressure. Heavier folks need to be wary, though, that their weight does not bottom out in the softer materials, and a firmer bed may be better suited for their body, even when they are lying on their side. The preferences for back sleepers tend to be all over the map, depending on where you carry your weight and what feel you like best. Some back sleepers like a firmer bed that puts a greater emphasis on support, but a firmer bed may not be as comfortable for some, especially those with pain points to consider. You’ll want to look for the right balance to cradle your shape while also supporting your lumbar and spine alignment. Heavier folks in particular need to be mindful of stomach sleeping as beds that are not firm enough can leave their hips uncomfortably dipped inside the mattress, which makes it impossible for the spine to remain in a neutral position (you can learn more about stomach sleeping here). If you are a person who carries most of your weight in your hips and abdomen, you’ll likely want to steer towards firmer beds. If you have trouble committing to one sleep position and are more actively flipping around at night, you’ll want to consider beds that are aimed at versatility (you can learn more about combination sleeping here). You should also think about which sleep positions you sleep in most often. The needs of a side and back combination may be different than a back and stomach combination. See recommendations above, and look for beds that can tick the boxes in special considerations for each of your preferences. One of the most common complaints from overweight and larger people is that they get too hot during sleep. It usually happens when your mattress doesn’t have enough room to breathe and to provide enough air circulation. In most cases, foam material “sleeps hot” when compared to latex, innersprings, and hybrids. These days, this problem is solved if you don’t buy cheaper options and opt for more premium products. Most of these also have a gel layer or infusion which serves as additional cooling material on top of your bed. Considering how widespread this issue is even for light sleepers, manufacturers created specialized “cooling” beds to improve airflow properties and heat distribution. This isn’t mandatory, but it’s great to have if you use your bed during the day. If you frequently sit on the edge, this can play a significant role. It also means that your bed should be more durable and last longer, and it is usually an indication of a premium product. Hybrid and coil-on-coil construction have historically provided great edge support. Different body sizes require different blends of comfort and support, and a bed with enough support for a heavier person may feel like a rock for someone who is much lighter. Couples who are very different may consider a brand that offers dual-sided firmness so that each partner may select what works best for them. 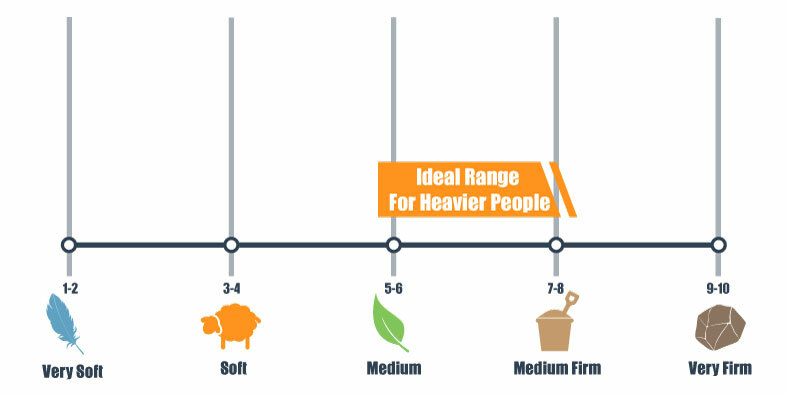 If both you and your partner are substantially heavier than average, you do have a handful of options out there. In recent years, the online market has introduced beds designed specifically for heavier folks with enhanced support systems and durability. So many people spend years sleeping on an outdated or saggy mattress because they just don’t think their finances can accommodate something new. Heavier people not only wear out their sleep space much quicker compared to more average-sized individuals, they also may falsely believe that a brand capable of supporting their body comfortably is automatically outside the limits of their budget. Online mattress companies have opened the door for many people – heavier folks included – to a high quality sleep that they can afford. Some details that heavier folks may look for include firmness option, as a firmer bed is likely to feel softer to someone is heavier. They might also want to look for zoning in the support layers, as this can help keep even the heaviest portions of their bodies level with the rest of their shape. Features like enhanced support and firmer foams and coils can cost a lot in retail stores, but many online brands may be able to offer similar features at a greatly reduced price. There are many types and materials on the market today (as we've described in our top mattress list for 2019). Each style has their strengths and weaknesses when it comes to overweight people. In this section, we’ll break down the major bed types (memory foam, latex, innerspring, and hybrid) and how they can affect heavy sleepers. According to many large and more cumbersome sleepers, memory foam is one of the best bed types out there. Why? Foam mattresses, whether they are on the hard or soft side, do a great job at evening out pressure points. One of the biggest complaints that obese sleepers have is that certain areas of their body end up hurting (i.e., their back or hips). 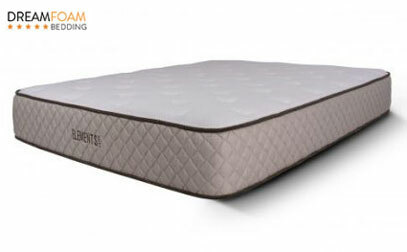 Memory foam does a fantastic job of providing evening support that contours to the body. Despite the numerous benefits, this mattress style can cause people to feel hot due to the lack of breathability in the material. Worry not, there are some great cooling memory foam options on the market today. 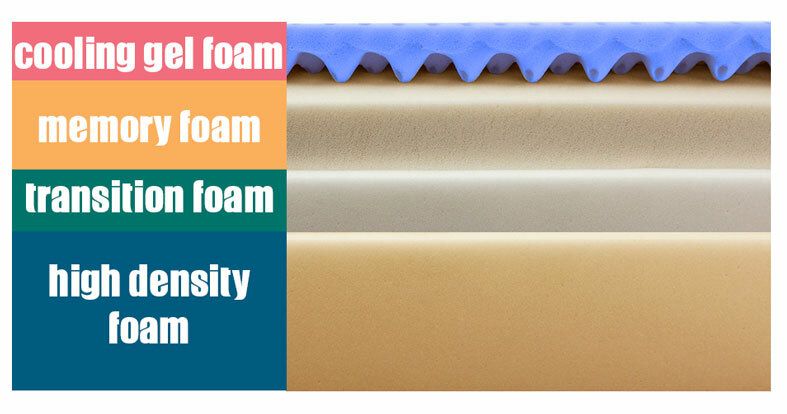 Read our memory foam article to learn more. For overweight people, latex mattresses are a solid option as well. Latex tends to be much better at keeping you cool, unlike most memory traditional foam bed options out there. That said, you're going to get a different feel than we discussed above. If you do decide to purchase an innerspring, make sure to go with a high-quality option. A sign of this type of quality is a coil-on-coil build. This technology uses two springs which make the support better, especially for big people. Besides, your bed will last longer with coil-on-coil vs. a cheaper alternative — one of the biggest complaints of traditional innersprings is that the support and comfort don’t last long. If you want to learn more about this category you can check our innerspring bed recommendations. As the name suggests, a hybrid mattress is simply the combination of two or more types. Unless we know the exact bed you’ve chosen, we can’t say whether it’s a perfect match for you or not. A great hybrid option would be a memory foam and latex or foam/coil combo. Foam offers great pain relief which is something heavy people deal with while sleeping. And the latex or coils can help keep your body cool at night while adding more bounce. Many newer mattress models are being sold online and go through a compression process that allows them to be roll-packed into smaller boxes for easier shipping. This process greatly reduces overhead, and many bed-in-a-box brands are able to offer pretty outstanding savings and value for their price. To help facilitate this boxing process, however, these brands use materials that can be compressed. Folks with heavier weight considerations should evaluate brands carefully for manufacturer recommended weight limits and features that can offer them the additional support they might require. Boxed brands with zoned support systems, foam and coil hybrids, firmer materials, or extra height might be a better match. You should not believe, however, that your weight considerations preclude shopping for your mattress online. There are many online brands that specifically target higher weight concerns by not compressing their product, and there bed-in-a-box brands with added details that should support your frame just as comfortably as an in-store model. The worst part about owning a product that is not good for you is that you might not realize it until you get one that makes the difference. If you are a heavy person, or in the morbid obesity category, it can get even worse with a bad mattress: backaches, inadequate support, and high temperatures during sleep can make your nights everything but enjoyable. On the other hand, if you happen to take the time to know what to search for when buying a new bed, you can end up with something that will change your life. Not only can neck and lumbar pains disappear, but you could even get one that will help regulate the heat at night, making your sleep a much cooler one. Moreover, your body will be supported, and you won’t feel like you are sleeping on a water bag. All of these things together can improve your body’s posture, muscular health, and even your mood! Because who does not wake up bad-tempered the morning after a bad night? Having these aspects in mind, we compiled the top mattresses for overweight people that we found in our research and hope you enjoyed the list. Can Extra Weight Cause Sleep Apnea? According to research, excess weight can definitely put one at risk of developing obstructive sleep apnea because softer tissues in your mouth and throat can obstruct your breathing, which affects your oxygen levels and sleep. One of the most common suggestions for reducing the symptoms of OSA is weight loss. Unfortunately, it all creates a frustrating cycle because insufficient sleep can cause you to gain weight and the extra weight only makes your condition worse. Intervention by a doctor for one or both of these conditions should put you on the road to recovery. Learn more in our guide and top bed picks for those who have sleep apnea here. When you already know what to look for, picking the Best Mattresses for Heavy People can become an easier task, especially after you find out how much of your life can improve by only having a deep and sound sleep at night. A large person can consider a firm bed that supports their body and regulates the temperature during sleep, and this is why we picked these beds and categorized them so you can know what to anticipate from each model. Memory Foam or Spring Mattress? Which Is Better For You? What's The Best Innerspring Bed For 2019? I am about 350 lbs and am torn between winkbeds and dreamcloud. I know winkbeds are made in the US and dreamclouds are made in china. I sleep on my back and my side. I really need help to make this decision it is a big outlay of money. I’m not sure if you purchased a mattress yet but I have information to share. I am close to 300 pounds and bought the dream cloud. I’ve had it about 6 months and I have to return it. I’m a side sleeper and I tend to sit on the edge. This mattress is not supportive enough. I sink in and have trouble turning over. I wouldn’t recommend this mattress for anyone over 250 pds. I’m looking into a winkbeds plus. The big fig is too expensive. Good luck. wow. That’s a tough choice. We will add that combination to our comparison list and hopefully shed some more light for our readers. I know it’s a big purchase, but both beds have excellent warranties and sleep trials so you can always return the bed if you don’t think you made the right choice. Let us know what you decide! I am curious about the recommendations and what might make a difference for someone roughly 275 and basically in bed all day WITH AN ADJUSTABLE BASE frame….